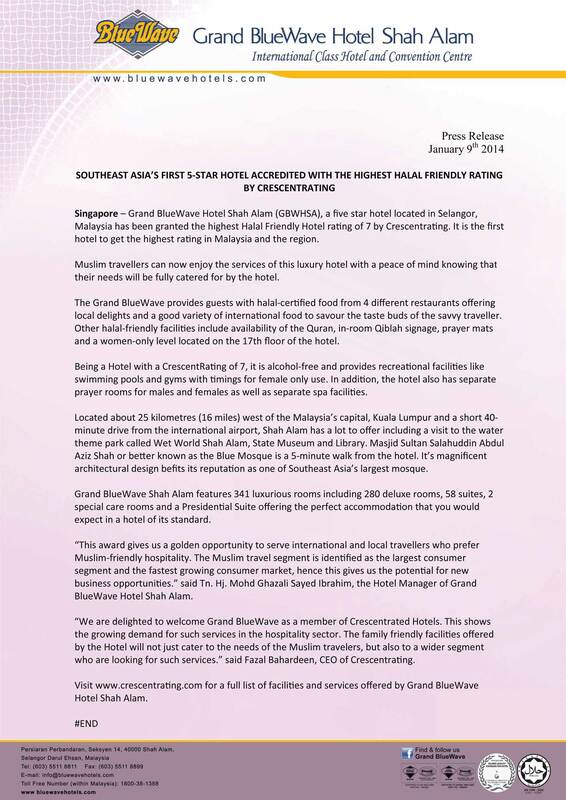 Experience the splendour of Malaysian hospitality at the Grand BlueWave Hotel Shah Alam! Enjoy the full luxury of a 5-star business hotel in the heart of Shah Alam with friendly, graceful and refined services. Savour the unique brand of hospitality that has important elements of Japanese dedication and attention to details. Strategically located in the suburbs of Kuala Lumpur and in the heart of the business and commercial hub of Shah Alam, this 5-star hotel is located next to the State Museum and Library, and just a 5 minute walk away from the famous Blue Mosque. It is the perfect location for businesses from Kuala Lumpur City Centre and only 40 minutes to Kuala Lumpur international Airport in Sepang. Port Klang and the Klang Valley Industrial areas are only minutes away. Grand BlueWave Hotel Shah Alam features 341 luxurious rooms including 280 deluxe rooms, 58 suites, 2 special care rooms and a Presidential Suite for your perfect accommodation in Shah Alam. All rooms are modernly equipped and with wide glass windows offering a panoramic view of the majestic ‘Blue Mosque’ or garden city of Shah Alam.